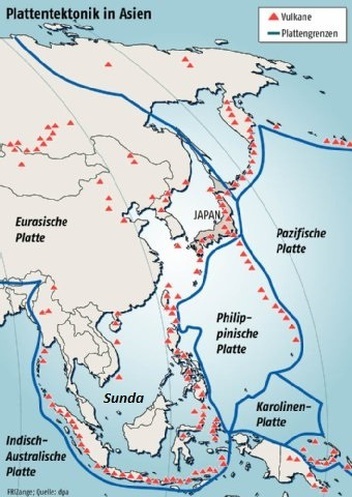 The Sunda Plate (also known as the Sundaland Block) is surrounded in every direction by tectonically active convergent boundaries, below which are subducting: the Phillippine Sea Plate to the East, and the Indo-Australian Plate to the South. The Sunda Plate's northern boundary is defined by its relatively slow, progressive collision with the Eurasian Plate which the Sundaland Block was once considered part of (Baroux, 1998). This particular region of South-East Asia is considered to be one of the most seismically active and tectonically complex regions on Earth (Kroker, 2012). The northward moving Indo-Australian Plate is colliding with the Eurasian Plate, and therefore, being slowed relative to its northward migration and collision with the southern edge of the Sunda Plate, which leads to an increase of differential tensions within the Indo-Australian Plate (Kroker, 2012). These stark contrasts in tensions within the large, colliding Indo-Australian Plate are thought to deform the plate boundary itself at the subduction zones (Sunda Arc) and are assumed to have the potential to generate the development of subsequent boundaries in the region, essentially breaking up the Sunda Plate into smaller micro-plates (Kroker, 2012). The rotation axis of the Sundaland block, according to 2007 estimates, is thought to be positioned at 49.0°N-94.2°E and exhibits a clockwise rotation of 0.34 degrees per million years (Simons, 2007). The Sunda Plate moves in a general Eastward direction, at a rate of 6 ± 1 mm/y at its southernmost boundary, and moves at a rate of 10± 1 mm/y at its northern boundary (Simons, 2007). There is still recent debate as to whether the Sunda Plate in itself is moving as an independent lithospheric block, or if it can still be considered a stable extension of its northward-neighbouring Eurasian Plate (Simons, 2007). Recent observations seem to indicate that the Sunda plate itself may be subject to very little intra-plate deformation, as evidenced by the low level of background seismicity being produced (Baroux, 1998). The Sunda Arc, a seismically active convergent boundary, is the area along the Southwestern portion of the Sunda plate below which the northward-moving Indo-Australian plate is being subducted (Curray, 1989). The Sunda Arc is approximately 6000 km long and extends from the northern tip of Indonesian island of Sumatra to the western tip of Papua/New Guinea. The arc in itself is characterized by a high degree of volcanic activity of mostly andesitic composition (Curray, 1989). A famous volcano, situated in this region of the former Dutch East Indies is Krakatau, whose 1883 eruption had the effect of darkening the skies and cooled the planet significantly over the next year (Bureau of Meteorology, 2012). Figure 3: A model of the Sunda Arc, displaying modelled accretionary prisms within the Sunda Arc and the fore-arc basin slope toward the Sunda Trench off the Javanese Coast (Image source: Curray, 1989). The Sunda Arc boundary is also constrained on its outer side by the Sunda Trench, an area of depressed elevation and of downward sloping fore-arc basins (see Fig 3), but this trench does not reach such significant depths as the Marianas Trench (Curray, 1989). (Unknown Author). 2012. "The eruption of Krakatoa, August 27, 1883". Commonwealth of Australia, Bureau of Meteorology. Accessed January 15, 2014. Curray, J. 1989. The Sunda Arc: A Model for Oblique Plate Convergence. Netherlands Journal of Sea Research, vol. 24 (2/3), 131-140. Kroker, H. 2012. October 17th. Überraschung im Indischen Ozean. Retrieved from: http://www.planeterde.de/wissen/ueberraschung-im-indischen-ozean. Accessed January 15, 2014. Simons, W. J. F. et al. 2007. A decade of GPS in Southeast Asia: Resolving Sundaland motion and boundaries. Journal of Geophysical Research, vol. 112, B06420, doi:10.1029/2005JB003868. Page created by Patrick Lanouette. The ''Tectonics of Asia'' Weebly webpage was created for the course EPSC 350 - Tectonics, McGill University, January 2014. Please also consult and cite the original sources (above).